A Bachelor’s degree in Library and Information Science with at least 55% marks or its equivalent grade. 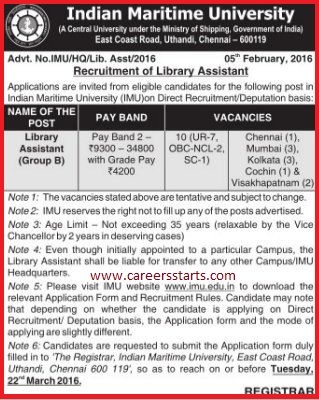 Two years’ experience as Library Assistant or equivalent in a University/College library. How to Apply: Interested and eligible candidates should send thier application form to the following address. Chennai – 600119, Tamil Nadu.